Google Account Manager apk helps to remove lock from android devices easily. In the world today, it is too hard to live without our smartphones. From booking a ticket to storing essential data, we use our smartphones for almost everything. So, it is really impossible for us to think a day without access to our phones. Thus, to think that you will lose access to your phone due to Factory Reset Protection Lock while performing the factory reset on your phone is really unbearable. All you need is the Google Account Manager apk which will provide you with a perfect solution. When you hear the term Google Account Manager APK, you automatically want to know more about it. So, what is it in actual reality? The Google Account Manager is actually an application that lets you perform FRP bypass if you forget your Google account details. Well, what are we talking about? Most probably, this is the thing that you are thinking about right now. You may already know that Google powers all the Android devices. Thus, Google asks for the existing account details every time you perform the factory reset. The locking feature that prevents you from having access to your device, in turn, is known as Factory Reset Protection or the FRP Lock. If you remember your Google account details, then you will have no trouble in accessing your phone. But the real trouble arises when you forget the account details and without proper account details, it is impossible to perform FRP bypass. Does that mean you will lose the access to your phone permanently? Of course, not! Since this application offers you the perfect way to unlock your device. 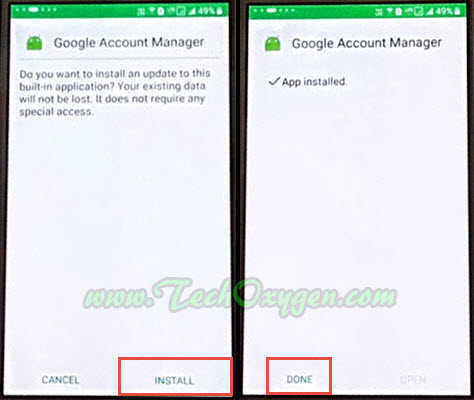 Before you know about the tricks to perform Google Account Manager APK download, it is wise to know about the system requirements and few things about this app in detail. The very first thing that you need to know about the Google Account Manager APK is that you do not need to have very high system requirements to run this application easily on the desired mobile phone. It requires only 7.9MB space and it requires only 512MB RAM to run perfectly. Furthermore, whether you are using Google account manager apk 5.0.1, Google Account Manager APK 5.1.1, Google account manager apk 6.0.1 and Google Account Manager Apk 7.0.1 or the latest version 7.1.2, if your device runs on at least Android Lollipop 5.0.1, then you will have no trouble in using the application in your mobile phone. Since the application has a small size and it runs in almost all Android devices, it is easily the best choice for bypassing your FRP lock. Now that you already know about the Google Account Manager in perfect details, let us discuss the features of the Google Account Manager. Actually, there are a plethora of apps that can help you to perform the FRP bypass but there is nothing as user-friendly and efficient as the Google Account Manager APK. Furthermore, most of the other applications are not at all trustworthy and they create more troubles for you. But that will never be the case when it comes to Google Account Manager. Do you want to know more about the features of this application? To be very honest, this application offers you a myriad of exciting features. However, it is not possible for us to fit all of them in the entirety of our article. That is why we have selected the best features for you and so that you can understand more about the app in proper details. The most important thing about the Google Account Manager APK is the fact it is very easy to use and completely user-friendly. When you are using this application, you will not have to use any complex procedures or follow any hard step. The app is very easy to download plus it is much easier to use. Furthermore, the user-interface is very friendly and you will not have any trouble in figuring out the options. Hence, you will be able to get rid of the factory reset protection to lock in almost no time. Plus, the app does not come with the hassle of rooting your phone or any such procedure. Thus, you will also be able to download it easily just by following some simple steps. While most of the apps charge you money to perform FRP bypass, you will never have to face any such hassle when you are using the Google Account Manager app. You can perform the Google Account Manager APK Download for free of cost. Furthermore, the application also does not charge any subscription fee from you. As a result, you will be able to use it without the hassle of making any payment. When you are using this application from Google LLC, you will not have to worry about the security concerns at all. The app is completely trustworthy and it successfully eliminates any risk of data loss or breaches completely. Google Account Manager Application is supported on all the devices that use Android Marshmallow 6.0 or higher versions. Furthermore, the application can run in with Sony Xperia, Motorola, Alcatel, Huawei, Google Pixel, Google Nexus, HTC and LG phones without any hassle. So, if you have any of these phones, then you will have no trouble in using the application. How to download Google Account Manager? You can easily download Google Account Manager APK from TechOxygen website from the links below. All you need to do, choose the right link which is suitable for your device and download the file. Click to permit the further installation from any unknown sources from the settings of your phone. Proceed to open the file and then install it. As soon as the app gets installed, you will be able to use it to bypass FRP lock. Well, that’s all for the guide to perform Google Account Manager APK download. The steps are easy to follow; so you will have no trouble to download and use the Google Account Manager. Android user can use this application to remove previously submitted Google account and it also helps to resubmit any new Google account details. Useful to bypass FRP lock completely from any of the android device. It has different versions for every single android patch (Android Version). For ex: Android Lollipop 5.x.x, Marshmallow 6.x.x, Nougat 7.x.x and Oreo 8.x.x. You have to use the right supported version of this apk according to your devices Android patch or android version otherwise it will make trouble in removing FRP bypass lock.